Abortion | My Life in a Bush of Ghosts. Today (April 4th), in the United Kingdom, a woman has been found guilty of having an abortion. It’s a horrifying idea – one which should have been long relegated to the annals of history, but which is sadly still the reality for a woman living in Northern Ireland in 2016. The 21-year-old woman was found guilty at Belfast High Court today and given a three month sentence, suspended for two years. She was convicted under ancient laws which were passed under Queen Victoria and have sat untouched on Northern Ireland’s statute books for over 150 years. 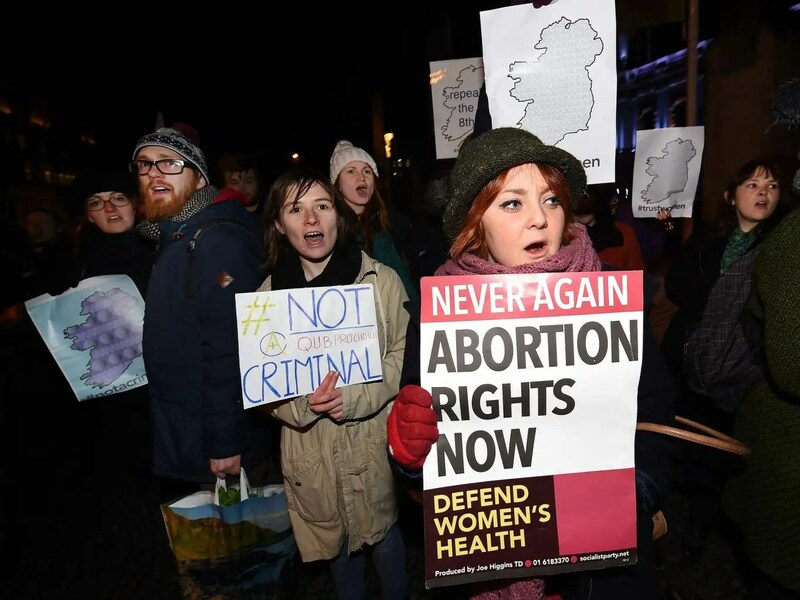 The abortion ban makes it a criminal offence, carrying a sentence of anything up to life in prison, even if you have been raped or if the foetus is so severely disabled that it has no chance of surviving outside the womb. The details which the court heard about this woman’s ‘crime’ reveal a heart-breaking nightmare. She was 19 when she experienced an unwanted pregnancy. She desperately tried to save up enough money to travel to England to have an abortion, but wasn’t able to. Left with no other choice and trapped in Northern Ireland, she bought abortion pills online and performed a DIY abortion on herself at home. Her housemates found blood-stained items and foetal remains in a bin and reported her to the police. Demonstrators gathered near Trump Tower in New York in response to US presidential candidate Donald Trump’s controversial abortion remarks. On Wednesday, Trump said during an interview with MSNBC that he thought abortion should be banned and women who get the procedure under such a ban should be punished. After an outcry from all corners of the political spectrum, the reality TV star quickly backpedalled and issued a statement saying the woman should be considered as a victim. Women who have abortions should be punished if the practice were illegal, Republican presidential frontrunner Donald Trump said on Wednesday, before retracting his claim amid an outcry. Trump, who has held opposing positions on the abortion in the past, said women should receive “some form of punishment” if it were banned in the US. He was unable to say whether he believed the punishment should be a small fine or a long prison sentence. The remarks prompted an outcry from all quarters, and once again underscored his poor approval ratings among women. The Democratic frontrunner, Hillary Clinton, decribed the comments as “horrific and telling”. Anti-abortion campaigners, who focus their efforts on punishing those who carry out abortions, distanced themselves from the remarks. Amid the storm, Trump issued a swift clarification of the comments. His position “had not changed”, he said, despite going on to fully recant the earlier statements he made to interviewer Chris Matthews on MSNBC. The latest Trump conflagration began during the taping of a town hall event, when Matthews asked him to define his “pro-life” stance and assertions that abortion should be banned. “Do you believe in punishment for abortion – yes or no – as a principle,” asked Matthews. “The answer is there has to be some form of punishment,” said Trump. “For the woman?” Matthews said. “Yeah, there has to be some form,” Trump replied. “Ten cents, 10 years, what,” Matthews asked again, pressing. “That I don’t know,” said Trump.